"It was raining. The weather was grey and mild." In this study, I'd like to analyze Maigret's relationship with the weather. We know how important the weather is for our Chief Inspector's moods, and the importance he attaches to the elements at the time of his investigations. At least that's the feeling we get after reading several Maigrets, but what exactly is the place of meteorology in the novels, what is the weather that Maigret encounters most often, which season is evoked most, how does Simenon describe the seasons, a particular month of the year... Such are the questions to which I'd like to provide some response. "Simenon had no memory for dates, as he himself recognized. But he retained a precise recall of circumstances, seasons and atmosphere down to the least detail: colors, odors, lighting…" (Lacassin in "Métamorphoses de Maigret", an essay written for the  Omnibus edition, "Maigret entre en scène" [Maigret takes the stage]). We can, justly, it seems to me, wonder about the influence of the season in which Simenon wrote a novel, on the season chosen for the action of the novel itself, so much does the weather described in the Maigrets play an important role in the unfolding of the investigation. In other words, is the season selected by Simenon for a novel dependent on the season in which it was written? Is it the same? Or on the contrary does he select a season unlike that in which he lives, in a sort of nostalgia for a past season? To answer this question, we have to examine the corpus. For this study I have only included the novels, ignoring the stories, considering the quantity of these to be representative. I've included 74 novels, leaving aside Maigret's Memoirs (which is a unique enough case since it's not limited to the telling of a single investigation), and Maigret's Christmas, whose length hovers between that of a novel and a story (cf. the study by Steve Trussel). 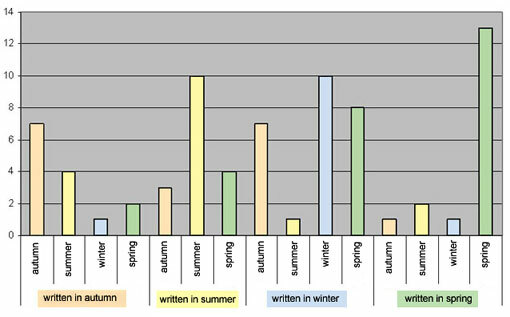 - of the 14 novels written in autumn, 7 (50%) take place in autumn. The remaining novels occur mainly in the summer, as if the memory of the season just gone by influenced the novelist's writing. 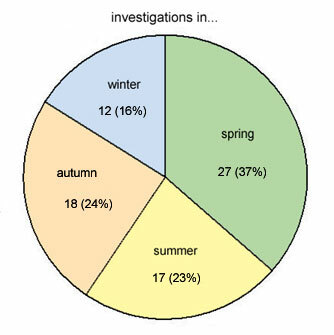 - for the 27 novels written in winter, the division is more equal... 10 novels (38%) take place in winter, 8 (31%) in spring, and 7 (26%) in autumn. Winter seems to have less influence on the author than the other seasons. When we think of Maigret, we often imagine our poor good Chief Inspector, hands shoved into the pockets of his overcoat, the pipe in his mouth having been extinguished by a fall downpour… But is that really a permanent reality in the Maigrets? 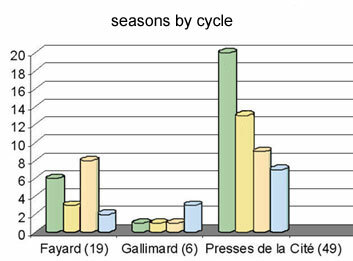 Up to this point, we have spoken of the seasons in a general way, but it can also be interesting to see which month best represents each season in Simenon's imagination. - the month which seems the most characteristic of spring, in Simenon's eyes, is the month of March (11 cases out of 27  40%); an opinion shared by Mme Maigret in MME: "For me, March is the most beautiful month of Paris, in spite of the sudden showers… Some prefer May or June, but March has so much more freshness." - as for autumn, it's hard to miss the month of November (10 cases out of 18, 56%), described by Simenon as a month of rain, wind and fog, as for example in FAN: "It was the middle of November. It had been raining all day." 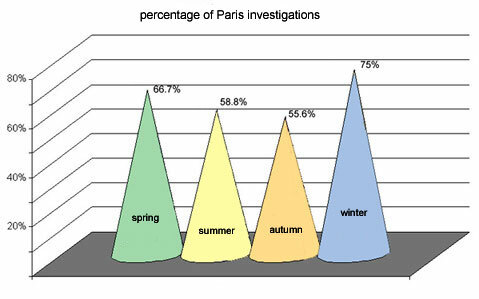 Here again, we are brought face-to-face with our potential clichés... the greatest percentage of investigations conducted by Maigret in Paris is in winter (9 cases of 12 occurring in winter, 75%), whereas we might perhaps have imagined a Chief Inspector passing the brightest of his time in the autumn fog of the capital city, such is not the case: 8 investigations of 18 (45%) in the fall take place away from Paris. Maybe not so astonishing after all... it's often in autumn that Maigret investigates in the Fayard cycle, and it's also in that cycle that he is often found outside of Paris. After winter, it's spring which is most represented in Paris (18 cases of 27, 66%), and this will be the chance for Simenon to describe the distinctive atmosphere of springtime in Paris (see below). Now let's go into the meteorological details of the seasons, to see if we can find, if they exist, any constants for each of them. In other words, how did Simenon see a season in general, rather sunny, nice weather, or rainy and intemperate? - in the springtime, 21 novels of 27 (78%) occur in basically sunny weather; rain dominates 6, and there is a marked alternation between the two in one novel (MEU). The sun and fine weather certainly seem characteristic of the springtime Simenon conceives of and represents. We note, with no great astonishment, that an analysis as a function of the month gives the same result (72% sunny cases in March, 60% in April, 100% in May, and 75 % when the month is not indicated). - this is even more the case in summer... the 17 novels of the cycle are all marked with the sign of a blazing sun reigning supreme... until a storm breaks out (a frequent occurrence in the novels). - autumn is synonymous with rain (dominating 16 of 18 novels, 88%)... but could it be otherwise? 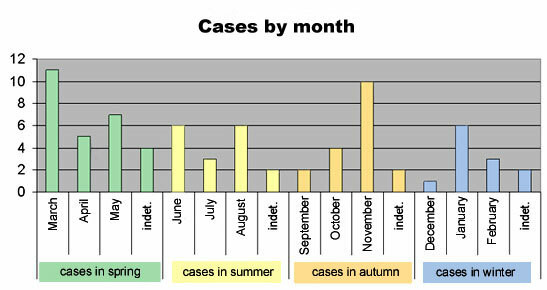 We note that the two cases in September (BRA and DAM) have more sun (it's still the end of summer), while 75% of the cases in October, 100% of those in November and 100% of the 'undetermined' cases, take place mostly in the rain. - finally, winter sees intemperate weather more often (10 out of 12 novels, 83%) than the sun, but here the rain can be replaced by snow. 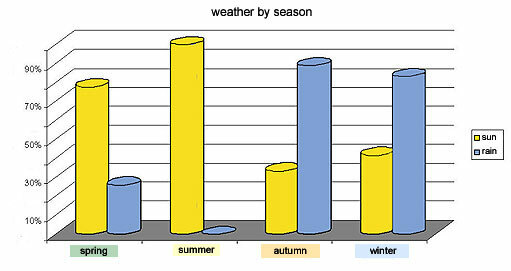 While investigations in December (VIN) see as much sun as rain, and above all the wind, those in January and without a specific month are marked 100% by snow or rain, while two cases (MAI and MOR) in the three in February unfold for the most part under the sun (spring is coming…), while the third in this month (MAJ) shows an alternation between the two. This part of my study will be devoted to presenting some extracts from the novels of the corpus, to illustrate with examples the elements examined above. Simenon gave Maigret his own sensitivity to atmospheric conditions. 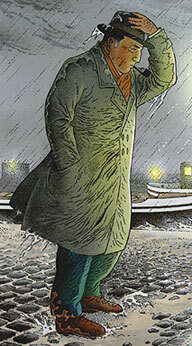 The author, like his character, savors the weather through all his senses. I'd like to end this study with several extracts which show how Simenon, with the simplest words, succeeds at evoking meteorological imagery in a very poetic form. In this study, we've rediscovered the relationships of Maigret and Simenon with the seasons, retouched certain clichés about the famous "Simenon atmosphere", and shown off once more the poetic art of Simenon... his use of the simplest words to paint a very colorful picture, also underlining his "filiation" with the Impressionist painters. The study isn't closed, far from it, and it could be followed further in many ways. For example, in analyzing the unfolding of a novel while watching the parallel development of the weather and the evolution of the investigation itself... Or comparing the description of a meteorological event (rain, heat-wave, etc.) and its influence on Maigret's feelings, unless the reverse is true too... the state of Maigret's spirit influences his vision of the weather.